Our trip started on Saturday October 6th where we left the drizzle (and my parents) in Bristol for Portsmouth Docks and the ferry to Bilbao (Northern Spain). Rain persisted and the wind howled causing the ferry embarkation to be delayed. Whilst in the queue waiting to board we got speaking to a chap (Pete) who was also going to Morocco on his own. We exchanged numbers incase of problems and hoped to see each other again somewhere down the line. When we finally left Portsmouth Docks, the sea state was force 7-8 and over the course of the 1st night picked up to a force 10! Lisa was ill for almost the entirety (~37hours) of the crossing. Landing in Bilbao later than planned on the Monday morning we anticipated a shorter day due to us never having driven abroad, but enthusiasm got the better of me and with a few breaks and average speed of 60mph we covered around 470miles getting past Madrid (our main concern). The following day saw us rising early (just before the sun) getting to Algeciras around 4pm, a rush to buy tickets and we were on the ferry by 4.30pm! (Were we mad, probably) Getting to the Moroccan border 2 hours before last light probably wasn’t the smartest of moves, but it does have some advantages, in that we got through in around 10minutes with zero hassle. Driving to Mirleft on the coast near Tetoun to find a good campsite just before dark, only stopping at an ATM for some quick cash. The following day we had to drive into Tetoun to find temporary car insurance and change up some euros’. The only place here for the insurance is opposite Cinema Espanola. Finding a bank, we changed nearly all our euros’ for a fistful of dirhams. Armed with these we headed south along main roads, taking the western approach to Meknes/Fes. As it was getting dark, we found Camping International in Fes, which was over priced and pretty basic. Being fresh in country, we were preyed on by a guide to take us through the Medina the following day. Suckers or not, we went (in the rain) and had a reasonably good day. 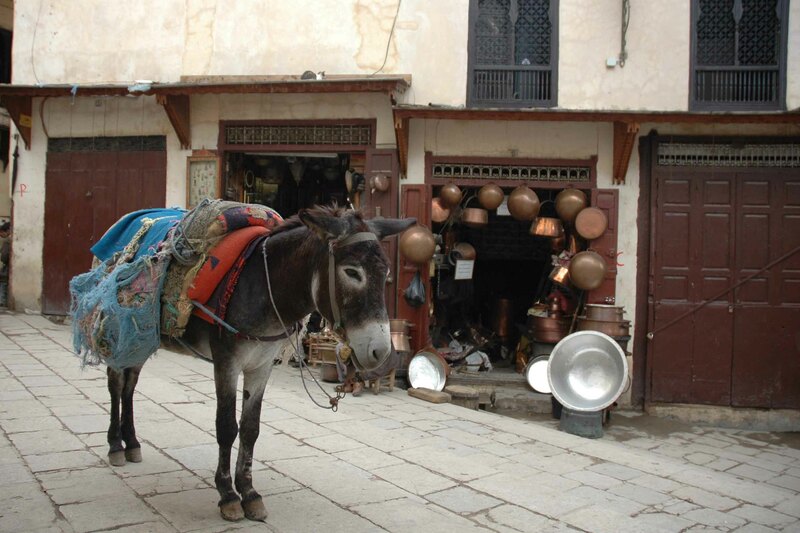 You sort of get to see the Medina, but you’re also ushered into shops to buy things for the guide to get commission. On the flip side, if you found your way into the medina on your own, there would be a good chance of you getting lost without a guide! After buying some ceramics and carpets we returned to the campsite (in the rain) and planned our nest day, a trip across the mountains, heading southeast towards Missour. Still raining the day started well. Following the piste road on the GPS was easy and the gravel track good. Winding our way downhill, crossing a bridge and heading up the other side, the roads on the GPS and 742 map didn’t match what was in front of us. Following the piste presented, we got back on coarse approximately 30km south winding our way into the mountains where thunderstorms and fog were all around us. By the early afternoon we reached a small town where the bridge had gone and the river was flowing too fast and too unpredictable to cross. With no other routes to choose, we headed back the way we came in the hope of going to Sefrou and south on the main road. Heading down the hill back to the 1st bridge we noticed that 3 logging trucks had stopped in our path, getting closer and paying more attention we noticed that the river was higher and wider than before. When we got to the bridge water was all around and we were too late to cross. Within 20 minutes the river had risen even more taking 2 single storey out buildings adjacent to the bridge. Trees were being snapped at their trunks all around. A family living next to the river invited us in for food and drink as we were now the only people on their side of the river (The logging trucks turned around and went another way). The water seemed to peak at this point and that’s when trees/branch debris snagged the power lines crossing the river snapping no less than 7 poles in quick succession. These included reinforced concrete ones too! Stood in amazement, it was like watching a movie. We asked the family if there was anything we could do, but with little on us and not being an electrician, we couldn’t do anything. This family were at the end of the line so who knows how long it will be before power is restored. Leaving late we took one route which headed out northwest, to find another bridge in passable. Doubling back, taking another route north it was now dark and the only route out of the mountains headed back to Fes. Driving through Fes in the dark and rain is not recommended. We arrived late at Camping International for yet another night. Feeling slightly deflated by the hassles of FES, the rain and the time spent stuck on the mountains we headed south on the main road past Sefrou heading for Midelt. We did try one piste heading east off the main road, but time and conditions were not favorable, so we decided against it. Arriving in Midelt we found the campsite was no longer there but managed to camp in a hotel car park about 50m from the original site. Midelt was pretty uneventful, but we did go to the local market to buy lots of fresh vegetables for 8dh. Leaving the next morning, we cut the day short for a break in Erfoud. Campsite here is OK and the people (Husain) are friendly with good advice. The piste heading southeast out of the city was washed away by the Oeud Ziz so the next day it was back on the main road heading south to Erg Chebbi which was approximately 60km from Erfoud. Arriving around midday we took some of the many worn tracks that criss-cross the approach to Erg Chebbi for a bit of fun in the sand and a break from the tar. Finally settling on a campsite called Le Dunes de Or in the northwestern region of the Erg. 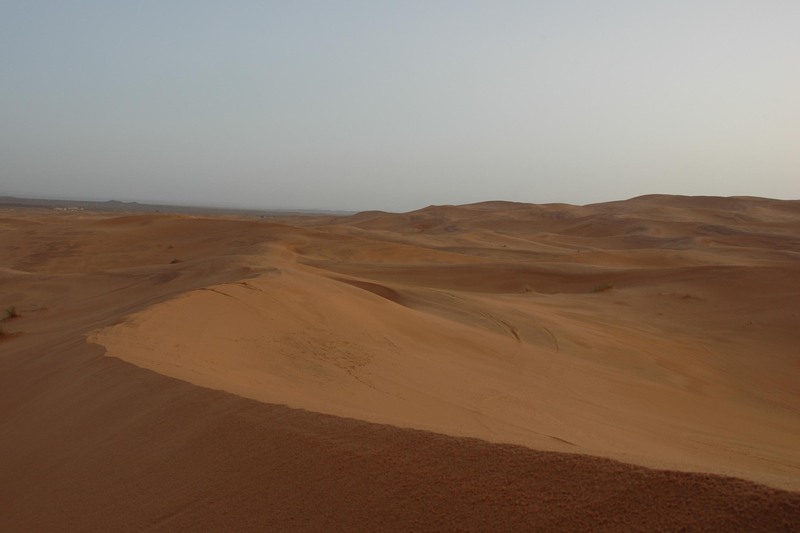 Here we just camped around the back of the auberge within some of the smaller dunes of Erg Chebbi. Feeling pleased and finally happy to be in the desert we chilled out for a few hours and didn’t do much. The next day we got up at 5.30am for the sunrise over the dunes quickly followed by bacon sandwiches for breakfast. The early morning also proved to be the best time for some dune bashing. Airing down we treaded carefully around the smaller section before venturing further a field. We never went very far from the camp as we were a single vehicle and I was a little worried about disaster being around every corner. We probably only covered around 2.5km of the dunes, but it was satisfying enough. With nothing much else to do we went for a spin down to Mezouga and onto Taouz to check piste conditions for the 200km stretch to Zagora. Before we even got to Taouz the road was cut by high flood water from an Oued originating in Algeria. Police reported that the Oued Ziz further down the piste also blocked the path. Deflated by this, we tried a few shorter pistes heading west from the main road, but the Ziz blocked us everywhere, so it was back to planning the course of the next few days.The following day we headed back north on tar with the Gorges being our destination. No fewer than 20km from Rissani the oil warning light came on. I wasn’t sure how early I had spotted this, but the now familiar “Griffiths Panic” was already setting in. pulling over we found engine oil covering the underside of pretty much everything resulting in it covering the backdoor and spare wheel too! Opening the bonnet confirmed that I had lost a lot of oil from somewhere. “Griffiths Panic” like you have never seen before! After getting under it and wiping a lot of oil off with toilet roll Lisa briefly started the engine which showed us that the leak originated from the outlet of the oil cooler pipe at the engine block. Tightening this up I thought my worries were over. Checking the dipstick proved dry. As I was only carrying 3 litres of 15/40w I promptly poured this in to discover… still a dry dipstick! Deciding to leave Lisa with the car I was walking toward an Auberge about 1km away when I noticed a 110 in the heat haze distance. As it approached the number plate began to become more recognizable. It was from the UK! Pulling over I explained what happened and they doubled back to Rissani to return with 10 litres of Shell Helix 20minutes later. After a cup of tea, some digestives, repayment for the oil and a few cans of San Miguel we parted. Ian and Nick, if you are reading this, your help was much appreciated. Driving along gingerly we crossed 2 swollen oueds heading west along the N12 to pick up the piste at Alnif heading north to Tinerhir. Finding the piste tarmaced lifted our spirits as we made time towards Tinerhir arriving at the campsite just before dark. Here we managed to download photos from memory cards onto CD and email family. We also met a cat with a bag hanging out of his arse (AKA shitbag) but that’s another story. The following day, after visiting the Super Marche and getting more Dirham’s from the ATM we headed onto the Todra Gorge. Here some local kids wanted a lift, so they hung onto the roll cage whilst standing on the rocksliders. A young bloke who spoke good English (and Japanese) also wanted a lift further up. Winding our way up the Todra on tar a few of the Oued crossings were washed out, but we got the landy across without any problems. This was the end of the line for normal cars as it was too rough. After dropping the kids off at Le Festival Auberge we came across people shoring up the retaining walls along the oued, which was now dry. We asked the older local to tell them “they were doing a good job and people really appreciated it”. Handing out Cigarettes, dates a figs we continued north on what was now excellent condition tar with no other vehicles on the road. We dropped the other guy off at Tamtattouchte continuing onto Ait Hani where we left the tar and headed northwest on rough piste. It was here we met the 20+ vehicle convoy know as the Land Rover Owner Adventure Club (run by Protrax) who were throwing pens out of windows whilst not stopping to give them to the kids. Laughing at the LRO sheep that spilled out £1250 to follow someone else’s dusty trail we headed onwards to Agoudal where we crossed some clean flowing streams and great big dirty mud puddles. After Agoudal the piste ended and we took the tar onto Imilchil. Heading up to Lac Tislit we camped there at an uber friendly auberge 2220m in the High Atlas. The clear sky and full moon were an awesome sight over the lake as the temperature dropped to a sprightly 7 degrees. The following day saw us retrace our steps back down to Agoudal and forking right to pick up the Dades Gorge piste. This piste was rough in places and wound its way up to a false summit of 2800m and later the 3000m pass. Here the path got narrow with a steep drop to our left and shear cliff to our right. This persisted for many kilometers over side sloping terrain and alpine style hairpin bends. 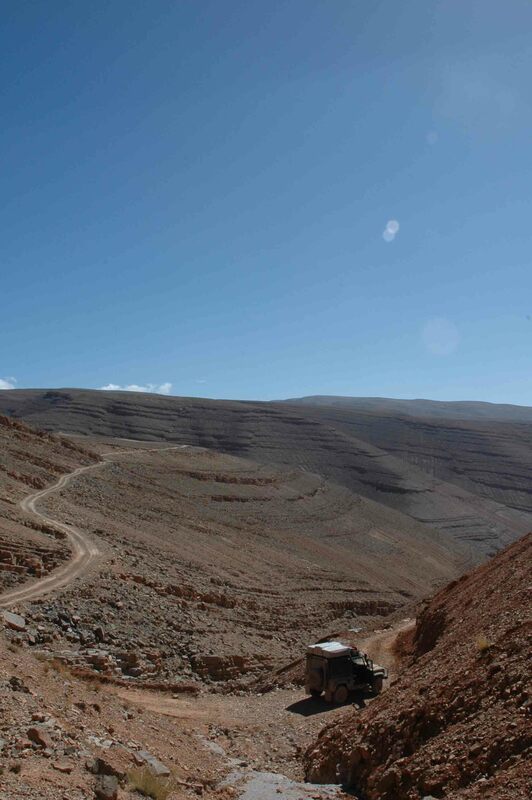 Finally we descended down into the Dades Gorge, not seeing a vehicle all day. The day ended with a short drive through Boulamine Dades where we headed for our chosen campsite east on the N10. After the long day of rough and nerve wracking piste driving I was glad the 0.5km stretch of gravel road to the campsite was smooth. Lining my wheels either side of some bedrock we cruised at around 30mph, suddenly the rock moved and two eyes stared back at me… DOG! Hitting the brakes with 10m to spare the dog didn’t get up or get very far before we heard its yelp passing under both axles. Getting out in a cloud of dust I went back to find him walking away shaken but unscathed. I couldn’t get close enough to him to see if any damage was done, who knows what happened to him afterwards. After a warmer and windless nights sleep we awoke to take the Tizi-n-Tazazert piste south from Dades to Nekob. What an excellent mountain piste, high enough for great photos (2200m), not so high is scares you senseless! And it has a cafe on top for some midday snacks. Gently descending down to Nekob we couldn’t find a campsite so headed east on the R108 to Tazzarine. This was a change point in the scenery as mountain backdrops gave way to sand, dune formations, heat haze and straight roads. In Tazzarine we stayed at a big camping complex much like Butlins, but were the only ones there! Here we got friendly with the gardener who gave us a load of fresh dates and citrus fruit before we departed the following day. The next day saw us taking another piste southwest towards Zagora. We missed the main junction for it, but picked it up further down the road. This started smooth but soon became rough when we passed a small village and then it decided to pour down! The tracks slowly veered off the piste on the GPS and petered out. We found ourselves in the middle of a wide boulder strewn oued. The GPS showed the piste no more than 50m to our left, but we couldn’t see it amidst the rain, fog and boulders. Picking our way across the oued and around the thorny trees we came to the bottom of a steep rocky embankment approximately 50m high. “The piste can’t be up there”. Rather than get out and get wet I decided on low box and a slow crawl to the top for a look… There is was, clear as day. 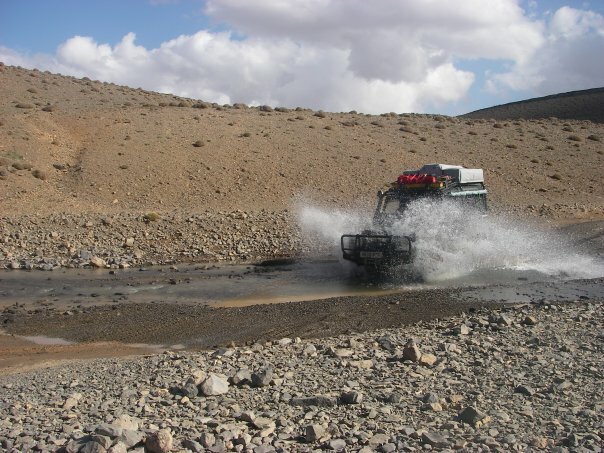 With the rain the oued started to run and its tributaries we crossed also flowed. This is a rough piste which got worse closer to Zagora. After four days of constant piste driving I was tired of the slow progress! 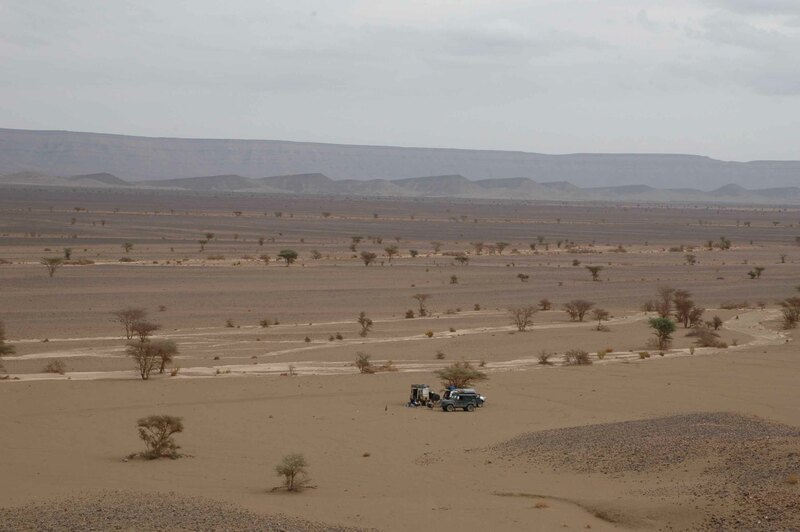 We got to Zagora and camped at Le Jardine, where a storm brewed and slowly passed. Later on I got a text from Pete saying he was heading to Zagora and sure enough after dark, he arrived with a South African couple in their Land Cruiser and trailer. Meeting them for food we exchanged stories on what had gone on and I told them about that day’s piste. They soon piped up “you running MT’s?”. “er, yer”, continuing on with my description I heard “and the bank in the oued was too steep so you reversed and took another line which went up a steep embankment?”… They had followed my tracks a few hours behind us! It later turned out that the Swiss couple we met also followed our tracks up that embankment. After a few beers and our latest night to date, we retired with the plan of a day trip south towards some small dunes and a general drive about. The next day was pretty uneventful, with a half day drive/explore and some steep dunes where Pete managed to get the front axle of his 110 3-4ft out of the top of the dune! No damage, it looked awesome. 21st we said goodbye to Pete, The SA’s, the Swiss (who left for the same piste a few hours before us) and a couple from Bristol who were taking their time. Picked up a 130km piste heading out west to Foum Zguid. Pretty challenging in places with some deep soft sand (but good run-ups), steep oued entries (had to be built up with rocks and flattened with spade) and a wide (150m) boulder filled oued crossing which had me filling my pants. They didn’t look that big when you walked it but driving it was difficult and I was worried about the axles. Maybe I should have found another way around? We crossed it anyway with little drama. The rest of the piste was excellent, fast in places (Dakar style), not many surprises and we picked up the tyre prints from the Swiss couple’s 7.5ton Swedish truck only to catch them up an hour later. After a bit of a chat we went on our way and 80km in the piste ramped up onto an earth embankment two lanes wide, compacted sand/gravel just waiting to be tarmaced. Hitting the gas we covered the remaining 50km in no time only slowing down for three oued crossings as the bridges had gone. Reaching Foum Zguid in good time we decided to crack on making a move for Tata. Here we camped in the middle of town and had a plesent evening. The next day we took the N12 through Akka and toward the coast, this would turn out to be our most southerly point of the trip and the sun was blazing with no hint of wind. I liked to think of this stretch of road as the desert highway. It was pretty barren with basalt ridges in the distance which also formed some small sand dunes. Not much vehicle activity on this road either so covering the miles we decided to push onto Sidi Ifni. Finally at the coast, we couldn’t decide to camp or hotel as the weather was closing in. Soon it rained and the decision was made for us! That night saw us discover Cafe Nomad, freshly opened that night after being closed for six months the owner welcomed us in where we ordered grilled sea bream and sole. Our 1st fish for at least 3 weeks! To say it was cooked to perfection would be an understatement. Freshly caught, cooked well served with loads of vegetables and only 70dh! It doesn’t come much better than this. The following morning after an excellent sleep we drove into town to get some pastries and coffee for breakfast and fuel up. Heading out south on the coastal road we picked some tracks that headed down to the beach were we drove for a few Km along the Atlantic Coast and rising out of the mist we saw the shipwrecked Zhara. Stopping for photos briefly we reconnected with the tar and headed inland following more pistes (where we saw a chameleon) to Fort Bou Jerif and onto Tiliouine looping around back to Sidi Ifni. Within minutes of arriving the SA’s turned up with news that Pete smashed his windscreen and was in Tiznit getting it sorted. Then the Swiss turned up to! As darkness fell, we arranged to take the Swiss to Cafe Nomad and then spotted that Pete had made it down to Sidi Ifni to. The 5 of us all went to Cafe Nomad and had a memorable evening (even if we did find the hotel bars closed at 11pm). The following morning we said our goodbyes to everyone knowing we wouldn’t see any of them again in Morocco and headed north up the coast and across through Tiznit onto Tafraoute where we passed the Bristol couple in the 110 going the other way (probably to Sidi Ifni). From here we took the surfaced mountain pass (R106) to Igherm where we found little to no accommodation so decided to make the next leg across another surfaced pass to Taliouine. After 400km from the coast to the High Atlas I was pretty beat. here we stayed at Camping Toubkal where I have to say, the food is crap. Its location however was prime, as the following day we took the 50km long mountain road to Azkaoun and followed a piste onwards to the north hoping to end the piste at Agouim approximately 80km away. Gradually our piste turned northwest away from the one on the GPS and Michelin map. I initially thought that we would pick up a different piste further to the west but as we progressed we found ourselves in the middle of the two with them being approximately 15km east and west of our position. The problem was that the piste was well worn and seemed the only viable option. We progressed as we were heading north anyway and conditions were good. To our left we could see Jbel Toubkal snowcapped and surrounded by cloud. The entire mountain chain was covered in snow and mist as our piste rose to 2500m. Thoroughly enjoying our surroundings and smooth quick vehicle free piste we stopped for lunch and cooked up a massive beef stew in our cast iron pot on charcoal. Delicious. Packed away, we set off to find our piste converging with the GPS piste from the east approximately 20km from Agouim. With 10km to go the piste became surfaced and we picked up the pace. Deciding we wanted to quickly visit Ait Benhaddou, we headed southeast finishing the day at a Hotel. Nice rooms and a good breakfast. The next day saw us head down a piste for a bit to see some film sets… but we didn’t recognize them so doubled back. A few photo’s of Ait and me playing in a river and we headed back north retracing our tracks up the N9 to take on the Tizi-n-Tichka which wasn’t as spectacular as we had hoped. Might have been to do with the amount of traffic and hassle on this route which we had not seen previously. Heading north to Ait Ourir we doglegged back past Sidi Rahal, Demnate and onto the Cascades de Ouzoud. Here we found an awesome campsite run by a Dutch couple (camping Zebra) up on the hill south of the cascades. Really clean and refreshing, full of overlanders and friendly people. A great night. The following morning we briefly visited the cascades which was a good choice, definitely worth a visit and some more time spent there. We then headed off on the N8 north for Azrou. The Lonely Planet recommended seeing the Cedar Forest around Azrou from the west, so we came off the N8 and passed through Ain Leuh. The road was windy along the contours of the mountain but the scenery wasn’t spectacular… should have stayed on the main road! We finally reached camp just before dark and brewed up just as it got really cold.The next morning we rose early as it was cold and made our way to Ifrane in the fog. Visibility was low and on entering Ifrane I thought we were in Switzerland! It looked like an alpine resort. We stopped in a patisserie for breakfast and a coffee, wonderful stuff. Leaving Ifrane we ventured north in the pouring rain onto Meknes and through to Volubilis, the Roman ruins. The rain eased as we wondered around with our guide wearing our waterproof jackets for the 1st time. After our 2 hour tour we decided it was best to push onto Chefchaouen in the far north. Driving in the rain as darkness fell we wound our way along contours and up hills gaining altitude from the valleys we traversed below. Reaching Chaouen at nightfall we pulled out the tent and fell asleep promptly. The following day we rose to a beautiful morning and decided to venture into town. Chefchaouen is a beautiful town as we had no hassle here at all. We were free to browse shops and stalls without interruption. A 1st in Morocco surely?! The next morning we were due to leave Morocco for Spain which would give us an extra day there as security incase anything went wrong before our departure from Bibao. Anyway, we got up late and really didn’t want to leave so spend another day in Chaouen! This time spending more time in the Medina meeting locals and taking plenty of photos. That night the wind came and rocked the roof tent stupid. Neither of us slept for more than 3 hours and decided to get up 45 minutes before the alarm at 6.15am. Washed and packed we left the campsite at 7am.Disappointed it was the end of the trip we made our way to the border, spending our last 150dh on gasoil. Crossing into Ceuta was an easy affair, where we promptly boarded the ferry for the force 9 crossing of the Gibraltar strait. Landing in Algeciras we headed out of the port onto the motorway and into some horrific wet weather, finally easing as we made our way north. The following day saw us travel 450 mile from Bailen all the way to Bilbao. Slightly unplanned as our ferry was not until 1pm the following day. At Bilbao we missed the port and ended up in a hotel 8km further out, here we bumped into the LRO club again, who happened to be in the same hotel and on the same ferry as us.The return leg was far smoother than our initial journey as we passed time by playing bananagrams. Buying a few gifts and cheap booze before departure, we disembarked at Portsmouth on Monday 3rd November at 9.15pm (in the rain) for the monotonous drive back to Bristol. With only a few pictures, some carpets and some unforgetable memories, this adventure, for the both of us, will be in our hearts forever.